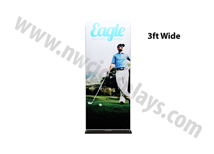 The EZ Extend banner stands are a great alternative to the traditional banner stands! 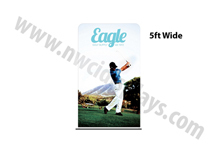 The EZ Extend banner stands come in multiples sizes to choose from and single or double sided printing options are available! The stretch fabric graphic goes over the tubular frame like a pillowcase giving the display a solid, clean and professional look! 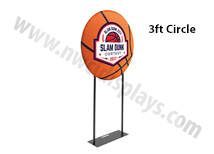 The EZ Extend banner stands also qualify for FREE GROUND shipping within the contintential U.S.! Replacement graphics are available for a quck and easy way to give the banner a new look! 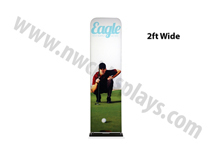 EZ Extend Banner Stands are stretch fabric banner stands. 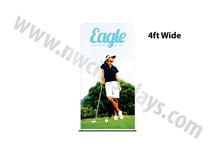 These fabric banner stands are printed with excellent quality. 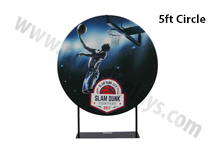 They are wrinkle resistant where as vinyl banners can crease. Fabric banners can be folded and when placed on the frame any wrinkles will work themselves out. Fabric banners have a classier more modern look to them. 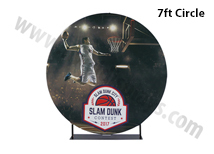 With the right artwork fabric banners print really vibrant colors so the graphic will stand out! These are available in both single and double sided and only take 3 days to produce! Looking for something that will stand out then these are a great option!